Eric Salzman (September 8, 1933 – November 13, 2017) was an American composer, scholar, author, impresario, music critic, and record producer. He was born in Queens, New York City. Salzman studied at Columbia University, Princeton University, and also in Italy and Germany. 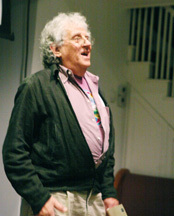 He was known for his work advancing the concept of "New Music Theater" as an independent art form. He co-founded the American Music Theater Festival and was, at the time of his death in 2017, Composer-in-Residence at the Center for Contemporary Opera in New York City. Salzman died on November 13, 2017 from a heart attack in New York City, aged 84. ↑ "Eric Salzman, CCO's Composer-in-Residence, Dies at 84". Center for Contemporary Opera. November 2017. Retrieved 2017-11-14. This page was last changed on 16 November 2017, at 10:47.